In 1995, the Columbia was one of five antique autos selected to be shown on a series of U.S. postage stamps. Its owners have included Queen Alexandra of England, President Theodore Roosevelt, steel magnate Andrew Carnegie, gold and art collector Solomon R. Guggenheim, financier Howard Gould, and many others both rich and famous—and not so. Its history arises from the bicycle industry and is entwined with that of a man known as the father of American bicycles—Albert Augustus Pope. Pope was a self-made man from Boston who learned the ins and outs of business at a very early age. Only nine when his father speculated in real estate and lost everything, young Albert worked his way through school. He rode a plough horse for a nearby farmer for several years before graduating to a business of buying produce from farmers and delivering it directly to customers, an enterprise that could bring in $100 a season. After leaving school at fifteen he sought another line of work, eventually settling on the shoe-findings and supplies business. Civil War broke out and the young man's passions turned to the study of military tactics and the challenge of preparing those in his shoe shop for military service. In short order he volunteered for service in the Union Army and at nineteen marched through Virginia, Tennessee, and Mississippi, mustering out as a 21-year old Brevet (you get the temporary rank but not the pay) Lieutenant Colonel. At the War's end he returned to what he knew and became president of a shoe-findings business. Then, in 1876, he visited the Philadelphia Exposition which celebrated the U.S. centennial and exhibited such new products as the typewriter, telephone, and Heinz ketchup. What caught Pope's eye, however, was the velocipede, an early bicycle with a large front wheel. The next year he had an English bike made for him and learned to ride it before ordering eight others. Convinced that bicycles were the next wave in transportation, he visited England to learn how they were manufactured, and in 1878 he started manufacturing his own bicycles at the Pope Manufacturing Co. using the Columbia name. His Columbia sold for $95 whereas an imported bike went for $113. (In addition to manufacturing, he took out all the U.S. patents he could on the European models so that other American manufacturers had to pay him about $10 for each bike they produced.) By the mid-1890s he was the leading U.S. bicycle producer, rolling out about 250,000 bikes per year—and he was becoming a very wealthy man. Pope set up shop in Hartford, Connecticut to take advantage of the skilled workers there, workers experienced in making firearms, clocks, and sewing machines. He determined to manufacture all the component parts he needed and ensured they were machined to fine tolerances. Parts were made interchangeable and easy to assemble and Pope designed an integrated assembly line, a concept Ford later adopted. There was a patent department, a legal department, a telegraph office, print shop, design and model room, forge shop, die making shop, lathe room to make parts, tiring room, assembly room, inspection room, paint shop, nickeling room, and storeroom for small parts. Pope was proud of the way he treated his employees, too, and proud that they never felt the need to unionize. On a tract of land near the factory he built dozens of houses which he sold at cost to his workers. At work, each employee had his own locker and sink, a stall in which to park his bicycle, and the use of the company library during off-hours. He could get a cheap cup of coffee and lunchtime soup at the canteen and might even play in the company's brass band. 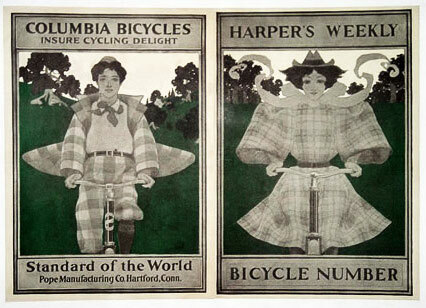 The great bicycle craze also coincided with a boom in advertising. In fact, at the height of the cycling fad roughly ten percent of magazine ads were devoted to selling bicycles. There were advertising buttons, lapel pins, paperweights, spoons, game counters (score keepers), ash trays, pen knives, scarf pins, rubber trousers guards, etc. Pope hired famed illustrators of the day and held annual poster contests, as well. An artist who later rose to great fame, Maxfield Parrish, won the first of those in 1896. His prize was a new bicycle and $250. New bicycle models were introduced each year and the press was invited in for the initial unveiling. Pope would later call upon this experience with advertising when he entered the automotive market. Another of Pope's interests that had significant applicability for the development of cars was road improvement. Because it was hard to learn to ride a bicycle and the newfangled things often scared horses, bicycles were banned from public highways. It might not have seemed like a great loss at the time because of the poor condition of roads generally but if there was no place to ride a bicycle, why would you buy one? At least that's what Pope may have been thinking as he formed the League of American Wheelmen in 1880, largely a collective of existing bicycle clubs, to lobby for creation of better roads. These cyclists began a national campaign for road improvement, encouraging the creation of public policy as to the location, construction, and maintenance of roads. They wanted to see a National Road Department with a Commissioner of Highways, a Corps of Engineers, and suitable appropriations. At the state level they recommended that states be divided into districts, each with its own supervisor to maintain old and construct new roads. They also added that taxes should be collected for road upkeep, that road construction should be contracted to professionals, and that roads should be classified according to use so accurate maps could be produced. To groups large and small Pope crossed the country speaking about the need for better roads. In 1893, Congress appropriated seed money for the Department of Agriculture, with an eye toward expanding markets for farm products, to look into the matter. Pope himself donated $6,000 to MIT for new highway engineering studies. While it wouldn't be until 1921 that substantial funding ($75 million) was committed to national highway improvement, Pope and his Wheelmen had raised popular concern and had begun to see planning for state highway departments. And, what at the time was most important, they were enjoying a few more paved roads. Even as cycling conditions improved, however, fewer bikes were being sold. Many automotive inventions utilized the bicycle's chain drive and differential gears as well as their higher-quality frame steel and rubber tires, and it didn't take long for car prices to fall within the reach of the middle class. Consumers were ready to trade up and bicycle manufacturers were left with a glut of unsold bicycles. Pope began to consider a move into auto production but also hedged his bets by creating the American Bicycle Co. Known popularly as the Bicycle Trust, it aimed to control production numbers and spread risk. Its members were bicycle companies that sold their stock and facilities to the Trust in exchange for an ownership share. Since only forty-five of the host of existing firms could be convinced to join up, though, overproduction and price wars continued—and, one by one, factories closed. Due to falling demand and fiscal irregularities, the American Bicycle Co. itself failed in 1901. To Electric Cars. . .
As fewer bicycles were being sold, Pope needed to keep his plants busy, and production of horseless carriages seemed just the way to accomplish that. There was one rather large problem, though; Pope didn't have a car blueprint. As he and his general manager George H. Day pondered that problem, a solution came to them. Hiram Percy Maxim, an MIT-trained mechanical engineer, in 1894 put a two-cylinder gasoline engine onto a used Columbia tandem tricycle. Presto, he had a horseless carriage with two forward gears and a reverse. Behind the magic, though, was a good bit of hard work. Maxim knew about internal combustion engines but had never seen one until he searched out a natural-gas powered Otto engine. That engine, invented by German Nicolaus Otto, was a single-cylinder, 4-stroke engine, one of the first to use a spark plug. Maxim wondered whether he could use gasoline instead of compressed gas, so he experimented. Since he was working at a projectile company, he found an open area outside where he poured gasoline into empty cartridge cases to see what would happen when it was ignited. Three years later he could proudly say he hadn't managed to blow himself up and he had a working, gasoline-powered engine. In 1895 Maxim contacted Pope about manufacturing his gasoline-powered automobile and toured the Hartford-based Pope bicycle works. Just a few months later, a Pope engineer visited Maxim to inspect his motorized trike and on the strength of the engineer's glowing recommendation, Pope offered Maxim the chief engineer job in developing the new motor carriage. Pope wanted someone to work on an electric vehicle—because such vehicles were quiet, reliable, safe, odorless, durable, and easy to operate. While impressed with what Maxim had achieved in his gasoline-powered vehicle, Pope memorably remarked, "You'll never get people to sit over an explosion". Maxim, on the other hand, wanted to continue tinkering with gasoline engines. The two eventually agreed that Maxim could work on developing both gas and electric cars. The first car Maxim produced for Pope in 1896 was the Mark I, an electric built with many bicycle components—steel tube, ball bearings, even wire-spoked wheels. It utilized a three-cylinder, 2-hp Eddy Electric motor (weighing 30 pounds, 2 ounces) and the worm and sector steering gear Maxim had designed. When it came to body design, Maxim deferred to Pope who selected a phaeton style built by the Mansuy Carriage Company. While the design of the Mark I may have been meant to be dynamic, it topped out at a roaring 12 mph. Since it could only go 25 miles on a single battery charge, Maxim worried about its limited range—but Pope was not to be denied in his pursuit of a marketable electric car. He and his lieutenants right away began to look at manufacturing costs, sales price, and production numbers. They didn't take long poring over the gas-powered Mark II version, though Maxim continued to perfect it. In 1897, for instance, he corrected a complaint about the loud noise of the gas engine when he invented the muffler, over time applying that technology to several areas of the vehicle. Eventually his gas-powered car would become quite advanced with full-elliptic springs, a front-mounted coil radiator, and left-hand steering. Pope, still convinced the electric was the car of the future, however, went full bore on the updated electric Mark III whose body design was the responsibility of the New Haven Carriage Company. Scurrying to correct small deficiencies, Pope and his senior staff quickly established a manufacturing department for the motor carriage and turned out ten production cars. Each car was powered by four sets of batteries, each set of batteries weighing 200 pounds. Total car weight was 1,900 pounds—so the batteries accounted for 42% of total weight. Following the public exhibition of the electric car and demonstration rides, the 1897 Mark III became a big success and Pope kept the Mark III-XIXs (a different number for each style from Omnibus to Dos-a Dos and from delivery wagon to surrey) rolling off the newly-named Columbia Automobile Company's assembly line. That year he produced a total of nearly 300 vehicles. 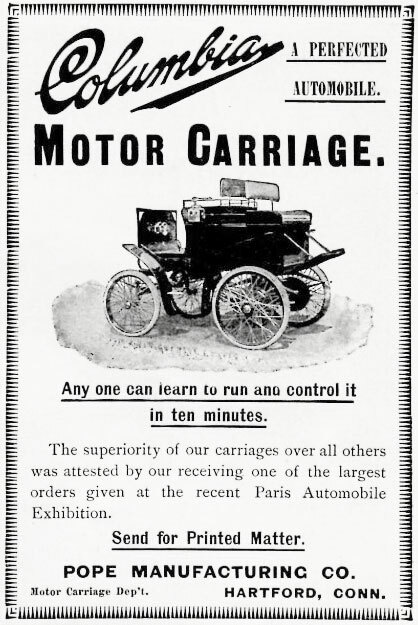 By 1898 the car was being advertised as "a perfected automobile" with the claim that anyone, in ten minutes, could learn to run and control it. You could learn to drive this car in 10 minutes..
Recalling his earlier business training, Pope wasted no time in marketing his horseless carriage. In one of his early manuals entitled "The Columbia Motor Carriage: Its Relation to the Horse, Together with Information of General Interest" he made some novel arguments favoring the horseless carriage over the horse-drawn one. He appealed to horse lovers, reminding them that a car could relieve fine horses of daily drudgery and he appealed to owners with skittish mounts by relating that the car, unlike a temperamental horse, could not be frightened. Then, in the summer of 1897, he opened a public charging station in well-to-do Newport, Rhode Island to introduce high society to his electric automobile. His Paris branch sold the L'Electromotion, supported by public garages to keep the batteries cleaned and charged—at Avenue Montaigne and at a second location near the Arc de Triomphe. 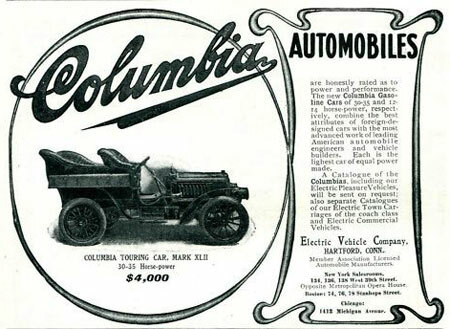 Columbia electric cars were sold in the UK as well, as City and Suburban cars. Users complained, however, about the difficulty of getting the electric car charged since even in wealthy homes it was still unusual to have electric lights. To answer their complaint Pope included a list of major charging stations in the Columbia owner's manual. Maxim also took a Columbia carriage for a test run from Hartford, Connecticut to Springfield, Massachusetts, detailing his findings in an 1897 article appearing in The Horseless Age. He found that he could get the car charged at an electric motor company, as long as he didn't need the charge during evening hours when the plant was closed, or at electric light stations. It took about three hours for a complete charge and charging costs averaged between 1-1/2 and 2 cents a mile. To The Electric Vehicle Trust. . . In New York City charging stations were available and Columbia carriages, delivery vans, and taxis could be seen driving about town. They had company, though. The Electric Carriage and Wagon Company (a holding company of several electric car companies, assembled by lead storage battery magnate Isaac L. Rice in 1897) had electric taxis taking commuters from the train station to their offices. When a deep snow in 1898 immobilized horse-drawn conveyances, the electric cars kept going. Financier William C. Whitney bought the company (renamed the Electric Vehicle Company) and promised to produce thousands more electric taxis. Few producers had experience with mass production of vehicles but Whitney knew of at least one—Col. Pope. Whitney and Thomas Fortune Ryan built a Wall Street syndicate comprised of New York and Connecticut millionaires and industrialists and devised a plan to monopolize surface transit in New York. They convinced Pope to bring his company on board, as well, and in April 1899, they launched the enlarged Electric Vehicle Company (EVC). EVC absorbed competitors and created electric taxi companies in New York, Philadelphia, Chicago, Washington, D. C., and Boston. That year Pope's factory output was a little less than half the total of U.S. cars sold. Things looked good for EVC at first but poorly performing vehicles, corrupt financial practices, and the ascendancy of gasoline-powered cars threatened the company. EVC still had an ace in the hole, though. When Pope mechanical engineer Herman F. Cuntz learned of an approved patent for the internal combustion engine, he told Maxim to halt production of gasoline carriages. Maxim ignored him but during negotiations for EVC, the Whitney concern did not. They went after the Selden patent for gas engines. Attorney George Selden first applied for a patent on a "road engine" in 1879 and year-by-year amended the patent application to reflect others' improvements—but his patent was rejected until 1895. Selden himself was no mechanic but he could see the worth of the internal combustion engine for car production. EVC paid Selden $10,000 outright for the patent and also agreed to a royalty of $5,000 per year. Then EVC went after automobile manufacturers, demanding a royalty of 5% of every car's retail value. To prove they were serious EVC brought suit against several manufacturers, including the well-known Winton Company of Cleveland. 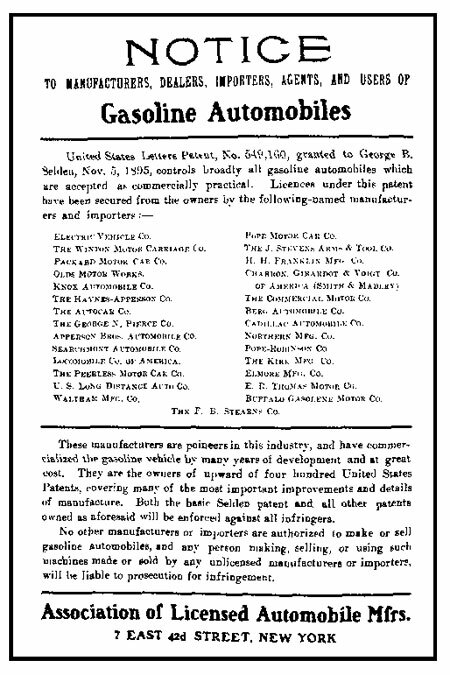 About thirty manufacturers licensed the patent but some manufacturers, including Winton, fought back. Winton spent so much challenging the patent's validity that by the early 1900s it was considering settlement. Other independent automobile manufacturers rallied round and formed a group to underpin Winton's defense by calling for lower royalty payments and the control of legal and license rights. If their offer was not accepted, they stated their intention to contribute to Winton's legal fund. By 1902 the association, newly named the Association of Licensed Automobile Manufacturers, had negotiated a 1-1/4% royalty rate (half to EVC, half to the Association). The Association also negotiated the right to determine which concerns could be licensed and which suits could be brought under the Selden patent. Winton became an Association member and EVC, looking at substantial legal costs to continue to press their case and having no guarantee of eventual success, caved and dropped the suit against Winton. Besides cutting the amount of royalties to be paid, the Association offered manufacturers a way to keep upstart car manufacturers out of the running. 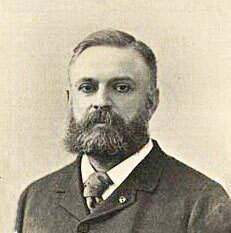 Two significant manufacturing concerns fought the association, though—Thomas B. Jeffery of Rambler and Henry Ford. Jeffery had produced Rambler bicycles first and had refused to pay Pope any royalties for bicycle patents; it was no stretch for him to refuse to license auto patents, as well. It probably also helped his case that he had patented the pneumatic "clincher" tire (so-named because the tire's pressure held it onto the rim). Tire manufacturers licensed that technology, and car makers needed the tires. In Ford's case he applied for a license but was refused because he had not yet proven an ability to make a commercial success of automobile production. Having been rebuffed, Ford brought suit. The case went to trial and some eight years later was resolved—in Ford's favor since the Selden patent was for two-cycle motors and Ford used four-cycle engines. By the time resolution was reached in 1911, EVC had bought Pope out (June 1900), allowing him to focus on saving the American Bicycle Company—and EVC was already bankrupt. And On to the Columbia's Later Years. 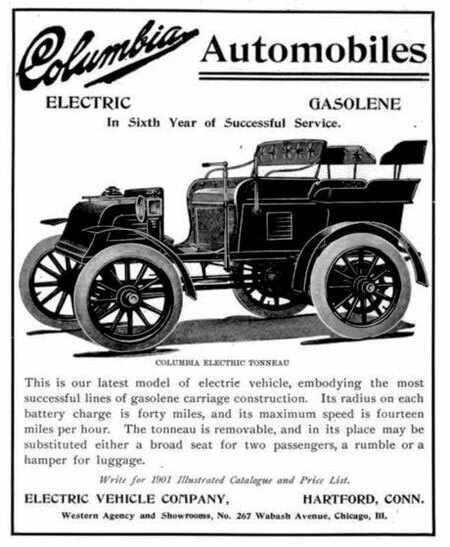 In the early years of the EVC-made Columbia, though, when EVC made money collecting royalties on the Selden patent, they brought out a number of gas-powered and electric-powered cars. The 1901 Columbias were advertised as having "Reliabilty and Service, Simplicity in Operation, Readiness in Action, [and] Cleanliness in Handling". New for the automotive industry, the 1900 gas car had its engine in front rather than under the driver's seat and its steering wheel on the left instead of a right-side tiller. Reflecting a time when drivers had to be mechanics as well, the 1901 gas runabout came supplied with a tool box that held an "ample supply of cotter pins, lock washers, and the like" to keep the car running. The 1901 Mark VII jaunting car, a tricycle with the driver sitting on a cycle saddle and utilizing handle bars, could carry "4 persons of light weight, or two heavy passengers". I suppose it was up to the driver to share those specs with his passengers. 1901 was also the year in which a Columbia Mark XII electric runabout went from Washington, D. C. to Baltimore on one charge, covering 44 miles with electricity to spare. Outside of major cities there was still a problem in keeping electric vehicles charged, though, so Columbia made this offer: "Where current cannot be conveniently supplied, we are prepared to furnish estimates for, and erect, where desired, simple and automatic plants for charging electric vehicles." Columbias were definitely attracting notice. A 1901 Columbia car carried mail from the Buffalo, New York post office to the Pan American Exposition of 1901 and a Columbia Mark XI was used to distribute books from the Library of Congress. Some Columbia interior features were meant to attract customers, too. The 1902 brougham, for instance, still with the driver outside and ahead of the passenger coach, came with a toilet case, clock, sterling silver scent bottles, umbrella holder, nickel mountings, black body with green panels, and driver-controlled side lamps—all for only $3500. 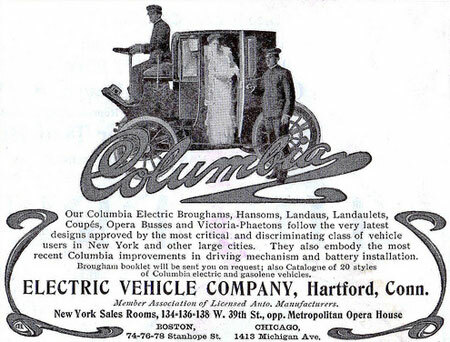 By 1903, the Columbia, still famed for such models as the Mark XIX electric surrey, often seen with fringe on top, was seeing service in new arenas, as well. The Mark XIX was an electric special service wagon, meant for inspectors, fire and police chiefs, and other senior officials. The Red Cross began using the Mark XI electric wagonette, as did sightseeing ventures, capitalizing on its ability to seat eleven passengers. The Columbia was also entering the upscale market. The Mark XI opera bus, for example, had front wheels smaller than the rear ones, beveled plate glass windows, even hat cords attached to the carriage roof. And marketing in England included an ad with famed actress Lillie Langtry modeling a sable motoring coat as she stood next to a landaulette. The Mark XIX electric cabriolet, claimed as "one of the most effective combinations of art and utility ever reached in an automobile" utilized claret-colored in broadcloth, silk curtains, mirrors, a card case, memo pad, speaking tube, and electric dome light—all the height of automotive fashion. 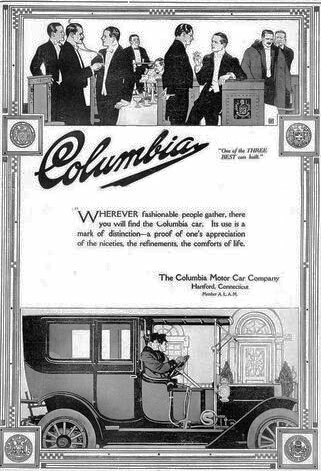 1903 Columbia ad promoting the Columbia Opera Bus. Columbias weren't just about luxury, though; they were also becoming known for success at road races. In 1903, a 24-hp, gas-powered Columbia, designed by Fred Law (who had headed the model department at Pope before joining EVC), made it from Chicago to New York in 76 hours. The following year a 30-hp gas-powered Columbia broke its own previous record by 14 hours, 8 minutes in the same Chicago to New York race. The confusion over whether gas or electric cars would prevail remained, even after the demise of the Columbia. In 1914, Ford and Edison collaborated to produce an electric. Ford was determined to use Edison's lighter-weight batteries but, because of high internal resistance, they could not power a car appropriately. When, without Ford's knowledge, someone substituted heavier standard batteries, Ford blew up. Despite a $1.5 million investment in the electric project, Ford moved on to other things. In 1904, there were more than thirty Columbia models—and both gasolene [sic] and electric carriages were heralded as "unequaled in construction, unapproached in equipment, [and] unmatched in finish and appointment". Gas-powered cars ranged from $1750 to $5500 while electrics ran $900 to $3500. A number of retail businesses utilized Columbias in the early 1900s—the Electric Light Co., Colliers Magazine, Edison Co., R.H. Macy & Co., Montgomery Ward & Co., Anheuser-Busch Budweiser, and numbers of hotels using them to transport guests. Columbia cars were also proving reliable enough to cover long distances; in 1904, a 2-cylinder tonneau was clocked from Philadelphia to New York in a little over 6 hours. In 1904 Columbia produced both electric and gasoline powered automobiles. Part of that reliability included a greater focus on customer service. The Columbia brougham featured an electric foot warmer for winter. For a charge, EVC could provide a gingham car cover and dummy wheels during shipment—and once the customer returned those items, EVC credited his account with the original amount paid. A 1906 Columbia ad highlighted customer satisfaction with a letter from a Fire Department Chief relating how well the Columbia had served him, going over steep grades and through torn-up streets: "Have been sceptic [sic] about automobiles previous to this great work, but now give them my hearty endorsement". The U.S. mail service was on board, too, with its first gas-powered vehicles. EVC claimed any one of the purpose-built mail delivery cars did the work of two horse-drawn carts. Despite the popularity of its cars, there was significant competition from other manufacturers and EVC went into receivership in 1907, an event from which it barely recovered. 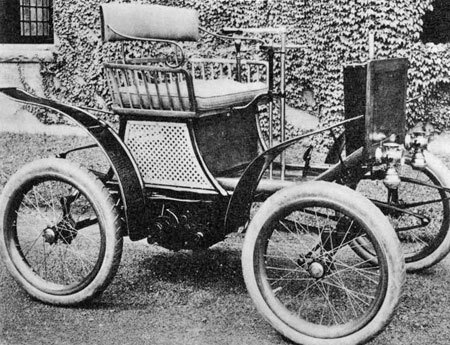 In 1907 and 1908 it produced a hybrid gas-electric vehicle called the Magnetic. The Model XLVI utilized a 4-cylinder, gasoline-powered engine to drive an electric generator that sent power to an electric motor on each rear wheel. There was no need for clutch or transmission since power to the electric motors controlled speed and direction. In '09 EVC, on its downward trajectory, produced just five gas and two electric models. In naming those models it did away with the use of roman numerals. Then, in June 1909, it was taken over by the Columbia Motor Car Co. That was followed in 1910 with its take over by U.S. Motor Co., one of the progenitors of Chrysler. 1913 was the last year the once-proud Columbias were produced.